First of all, I am SO thankful for Fabulous 4th Grade Froggies for hosting the upper elementary linky party. I've found SO many wonderful new blogs to stalk. There's nothing I love more than blog stalking. Anyway, this week my kiddos have been taking the dreaded PSSA (our standardized test) ... insert obligatory horror music. Needless to say, after three straight days their brains are mush, and they're a bit out of control. I wanted to brainstorm an activity we could do that would give them a creative outlet for their energy, but still tie into our curriculum. 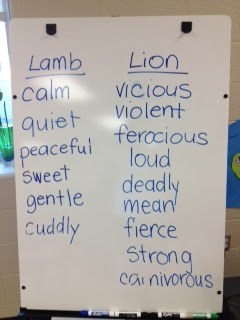 My students then used these words to think of an activity or time when they are like a lion and like a lamb. Each student had to think of a main idea: "I'm a lion when ..." or "I'm a lamb when..." Then, they used the words on the board to think of at least 5 details to support their main idea. They also had a put an example of figurative language in there since we just completed a whole unit on similes, metaphors, personification, and alliteration. Of course they piled them haphazardly on the windowsill in true ten-year-old fashion. 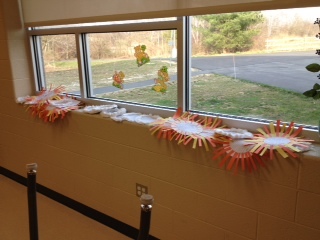 Then, I hung the ones that were finished (and dry) in the hallway. On a side note, why do kids always use seven pounds of glue when two drops is all you need? Tomorrow I'll have to hang the rest. Hopefully they will be dry!! I love this post! I teach Firsties but know I also need to understand what their learning looks like when they leave me. I understand the importance of building a strong foundation. We do all we can to teach them how to use glue...but it is an obsession for some. I would venture to guess that it does not change even in middle school! Thanks for following. Your blog is very adorable! 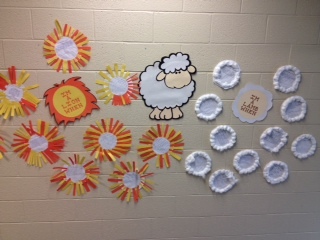 Love your lion and lamb lesson! just found your blog through the linky party. There are so many blogs to add to my stalk list! 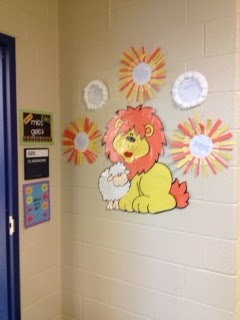 I love your Lion and Lamb lesson, if you won't mind I'll borrow it to teach my kiddos adjectives. I'm really thankful for the linky party, that's how I found you!!! !